This summer Norman Rockwell Museum has been proud to take part in #DanceForTheArts, a unique collaboration between cultural organizations here in the Berkshires. Earlier this year, the Museum joined IS183 Art School, Only In My Dreams Events, and Berkshire Theatre Group in marketing their various gala celebrations and dance parties—with common themes of creativity, pride, and the art of Andy Warhol—as a springboard for a more vibrant, healthy, and equitable Berkshires. 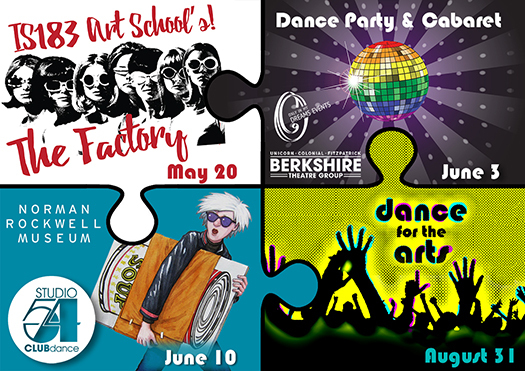 On Thursday, August 31, the #DanceForTheArts collaborative will celebrate with a final Summer Wrap Party from 7 to 10 p.m. at The Barn at The Egremont Village. Billed as a “Karaoke Lounge Evening,” the event will feature performances from KJ Spizz along with karaoke impresarios Ken DeLoreto, Michael Allen Lowe, and Pops Peterson. Those who attended IS183’s Factory, OIMDE and BTG’s Pride Dance, and NRM’s Studio 54 Dance Party will get in FREE. All others are asked to pay a suggested donation from $5 to $35 at the door, with all donations received from the evening given to MASS Creative, a state-wide advocacy organization that supports the efforts of our creative sector. For more information or to RSVP for the event, visit the #DanceForTheArts Facebook event at this link.